This week’s shocking loss of composer James Horner has upended the entire film music world. Everyone I know is still in disbelief. Many are using social-media platforms to eulogize him and recall their favorite scores. On Monday I wrote the obituary for Variety, after word came that his plane had crashed in Ventura County, Calif., and that he had not survived. And today I’ve added some personal thoughts and historical perspective in an appreciation piece dotted with photos of him taken over the past three decades. I liked James very much; we first met in the aftermath of his Titanic success, and over the years we spent hours on the phone discussing his subsequent work. This entry was posted in Composers, Film Music and tagged Film Music Society, James Horner, Titanic, Variety on June 24, 2015 by Jon Burlingame. 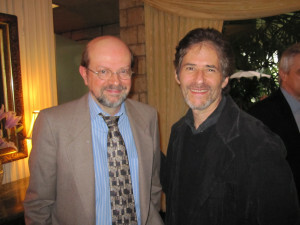 Post-Oscars but pre-Grammys, I interviewed composer James Horner about the Titanic experience, how he felt about it and the impact it was having on his life and career. The online version doesn’t indicate this, but it was a big front-page Calendar story with a nice photo of James. This entry was posted in Composers, Film Music, From the Files, Interviews and tagged Braveheart, Grammy, James Horner, Los Angeles Times, Mighty Joe Young, Oscar, Titanic on January 11, 1999 by Jon Burlingame.